Bhopal, the capital of Madhya Pradesh, is a fascinating amalgam of scenic beauty, old historic city and modern urban planning. It is situated on the site of an 11th century city Bhojpal, founded by Raja Bhoj. The present city was planned and established by an Afghan soldier, Dost Mohammed (1707-1740). His descendants build Bhopal into a beautiful city. From Raja Bhoj onwards there were many dynasties had ruled the place. The antediluvian remains in the place are the evidence to these facts. There are forts and temples built by the Rajputs in their era. The successive rulers had added to the glory of the place many gardens, forts, temples etc. There are few temples which was visited and prayed by the rulers of different faith even. Many kings have ruled here and enriched the character of the city. Raja Vikram Shah, during his reign had built few temples. He was devoted to Lord Ram and Lord Hanuman. One such built by him for the Lord Hanuman is presently known as Chola mandir. The temple is situated nearly two and half kilo meters from Bhopal main bus station, on the road leading to Vidisha and Sanchi. Perhaps the Chola mandir is one of the oldest Hanuman temples in the city. It is believed that the Lord Hanumans murthi was in existence in the place where the present temple is. It is believed that Raja Vikram Shah in the year 1405 had built this temple for the Lord. He had also performed punar jeeranotharan after completion of the temple. The Lord Hanuman of Chola temple had attracted the attention of many rulers, many kings and Begums who had subsequently ruled the place had lot of faith in the Lord Hanuman of Chola temple and had improved upon the needs of the devotees who were visiting the temple. To mention few, Begum Shahjahan and Begum Khurishia are most popular visitors of this temple during their time. They use to arrange for bhog for poor and devotees in general during the festivals and other aspious occasions. During last centaury, reign of Bhopal was a dispute between two brothers Sri Habibulla Khan and Sri Wally Hydir Khan, both of them claiming the throne and right to rule the State. Long legal battle was fought and it was heard in the Privy Council in London where legal luminaries of outstanding caliber were employed by the brothers. After final hearing was over the judgment was reserved. Both the brothers were waiting with there fingers crossed to know the final verdict, as to whom the throne will be. Sri Habibulla Khan had a minister by name Sri Awadh Narayan who uses to advice him on many matters. 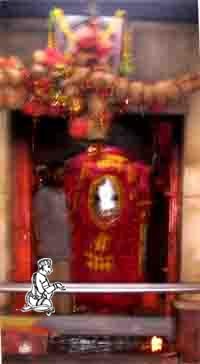 He is an ardent devotee of Lord Hanuman of Chola temple, and both Sri Habibulla Khan and Sri Awadh Narayan use to visit the temple as devotee and offer offerings. The minister saw the impatience of the king and requested him to have faith on the Lord Hanuman of Chola temple. On counseling with his minister Sri Habibulla Khan vowed to lay new road to the temple and also arrange for the Ramlela every year in the ground near the temple. Impatient he was, Sri Habibulla Khan set out for London to know the outcome of the legal suite. Those days the travel to London from Bhopal will be Bhopal to Bombay (presently Mumbai) by train and then from Bombay to London by ship. Sri Habibulla Khan left for Bombay and was to board the ship after a day or so. Alas! Even before he could board the ship he got the news that he had won the case against his brother Sri Wally Hydir Khan in the Privy Council and he was declared the ruler of the State. Joy found no boundary to Sri Habibulla Khan, and he rushed back to Bhopal to fulfill his vow towards Chola mandir. The first thing he did was to lay road to the temple, and conduct Sri Ramlela. It is warming to note that even today the Sri Ramlela is being conducted and witnessed by the decedents of the then ruler Sri Habibulla Khan. This is only to cite an example of things that Chola Mandir Hanumanji had granted to His devotee and faithful. Today it attracts large crowed everyday, and especially on Tuesday and Saturday temple attracts huge crowed from all corners of Bhopal. If you happen to visit this city of Bhopal go earn some blessings from Lord Hanuman of Chola mandir.